Ads on your webpage,Referring softwares,Shopping commisions - These are the different ways found by internet geeks till now to make some bucks.Now they have a new simpler way through which they can earn money.The service is called Agloco which is in the beta phase at this moment.Right now I can't give you statistics of how much you can earn through this new way.But Johnchow says they will be giving 5 shares a month to each of the users in the start. You can even earn more money through Agloco by referring it to your friends.By referring to 10 friends and they again referring to 5 ,you can make 9767.5 monthly hours which will pay you a lot so far as I think. What you have to do ??? 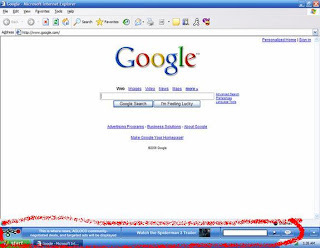 They want you to install their view bar software whih be be installed in the bottom of your browser as shown in the figure .I marked the area. Once you install you have to surf for 5 hours a month [Max limit is 5 hrs per person right now] with the view bar on.After 5 hours ,you can turn the view bar off.For making more money,you have to get referrals so that your man hours increase on Agloco. I signed up,But I can't find any view bar to download.Where will I find it??? "Right now Agloco view bar is in beta phase.They will start out rolling the view bar to their users from April 2 i.e today in the order of sign ups.So you will be getting it soon." This can be found in your My account page.Or you can give the above link to them.Once they sign up as your referral,the count in your my account page will increase.You income will get doubled for every 5 referrals you get. So build up you community and start earning as soon as you get the view bar software.Tell your friends and get them joined so that you can keep doubling your income. There is no way you can loose some money in this unless you are investing your money in adwords or other advertising service to get more signups.If the service is a hit,you might get more,but if it's not you might loose your money.Apart from that even if they give you shares,you are getting them just for free.If the company makes a fortune,you can also make money with these shares.So this just give you profit and 0% loss.So sign up for Agloco today adn own the internet.Once you sign up,let me know about it in comments of this post.